A pioneering book in the movement to recover the wisdom of Jesus as a Native Middle Eastern person. The Lord’s Prayer and Beatitudes in new, multi-layered translations. Douglas-Klotz is co-chair of the Steering Committee of the Mysticism Group of the American Academy of Religion and also a member of the Society of Biblical Studies, at whose annual conferences he presents his scholarly work. He is also well-known in the field of spirituality and has worked with the Anglican theologian Dr. Matthew Fox. “This book compares with the Dead Seal Scrolls and Elaine Pagels’ Gnostic Gospels in its revolutionary presentation of Jesus’ most beloved utterances–and it goes beyond them in making the material experiential. Here we find a Lord’s Prayer and Beatitudes that call even the most agnostic of ecofeminists and deep ecologists to reverence–and to a glad reconnection with forgotten roots of our shared culture. For the many of us who want to peel away centuries of dualistic, patriarchal forms and recover the life-affirming beauty of our Christian roots, nothing could be more welcome than this exquisite little volume. Breath a sigh of relief as you open Prayers of the Cosmos! It is high time we reclaimed the ecstatic love of creation that is at the heart of Jesus’ mission and message. ” Reader beware: this book contains the seeds of a revolution! Prayers of the Cosmos embraces, surprises, grounds, challenges. It opens our hearts to cosmology once again–as Jesus was open to cosmology and all native persons are open to cosmology. It allows the mysticism of our scriptural heritage to move us once again. Maybe even to transform us. It welcome this book and the rich fruit it is sure to bear. –from the Foreward by Matthew Fox, author of Original Blessing and Sheer Joy! For the many of us who want to peel away centuries of dualistic, patriarchal forms and recover the life-affirming beauty of our Christian roots, nothing could be more welcome than this exquisite little volume. Breath a sigh of relief as you open Prayers of the Cosmos. Only a “leader of the dance,” in love with sound, music and body–and one who is also an Aramaic scholar–could have rendered us this gift. My gratitude to Neil Douglas-Klotz is boundless, for it is high time we reclaimed the ecstatic love of creation that is at the heart of Jesus’ mission and message. Douglas-Klotz’s offering compares with the Dead Sea Scrolls and Elaine Pagel’s Gnostic Gospels in its revolutionary presentation of Jesus’ most beloved utterances. And it goes beyond them in making the material experiential, for this text is accompanied by “body prayers” that help us deeply integrate their good news. Here we find a Lord’s Prayer and Beatitudes that call even the most agnostic of ecofeminists and deep ecologists to reverence–and to a glad reconnection with the forgotten roots of our shared culture. For myself, as an ex-Presbyterian, Buddhist scholar and teacher, this book welcomes my home to my own Christian heritage. 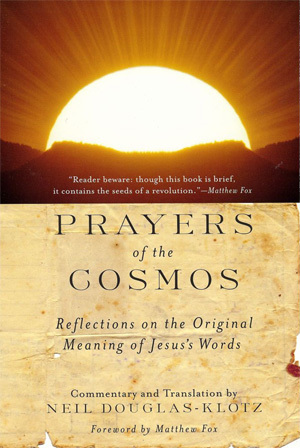 Prayers of the Cosmos will be a source of happy replenishment for individuals and of joyful collective practice for groups inside and outside of the church. HarperSanFrancisco, 90 pages,paperback. Kindle edition also available.